that mixes modern style with mountain chic. This time of year, it’s safe to say we’ve all had daydreams of spending these chilly winter days holed up in a cute cabin in the woods. While the woodland look certainly has more traditional roots, blending this rustic vibe with a modern aesthetic can give you that surrounded-by-nature feeling all season long. 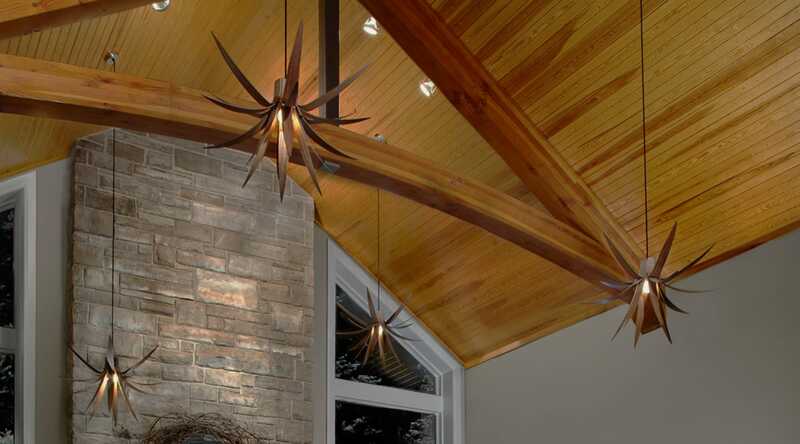 These days, the modern lodge look tends to blend urban-industrial metals with more rustic wood finishes. From a practical point of view, such materials are what enable the massive arched ceiling and open spaces of actual larger lodges. In your space, the combination of wood and metal will give you the warm, hardy feel you would expect in a cabin but without being overwhelmed by either. (Mixing river rocks, brick, cement and so forth with wood can also help you achieve a similar textural balance). A white interior both visually enlarges a space and complements the misty whites of winter outside (or the colors of any other season, really). But it can look somewhat stark by itself. Here, Danish modern wood chairs and an ombre rug warm up this bright, white dining area. Plus, this particular rug is made out of cowhide, which lends the contemporary space even more country cred. Aged-looking grey weathered woods can also warm up white spaces—or contrast coolly with darker ones. The rustic feel is retained with the wood material, but clean lines and an edgier finish keep things contemporary. The modern lodge would be lost without some soft textiles. The hardiness of wood juxtaposes nicely with a dark fabric, like Gus Modern’s Elk Chair. This piece offers a lightened take on the heavier, overstuffed pieces so often seen in traditional winter cabins. It's contemporary, yet still inviting enough to encourage cuddling up with a cup of cocoa. With all the talk of tones and textures, you might not consider one of the most important elements of the modern lodge: the opportunities for whimsy. Don’t be afraid to have a little fun. Tongue-in-cheek accents like shiny antler chandeliers, faux fur-covered ottomans or a statement-making light keep things feeling lighthearted and more personal to you. It is YOUR modern lodge, after all.